Q plan. – Dirty wet dog , boats and sailing. In my recent post QR 9 i discovered that i have got a health problem that i really have got to take responsibility for and ‘get sorted’. I am of course talking about ‘Q’ risk and the q risk calculator which shows me that i have an unacceptably high risk (13 %) of a heart attack in the next ten years. As i said before i would rather be sailing and a heart attack would rather spoil my day. Taking a look at the Q risk calculator and having kicked it around in discussion with others i find that i have risks or risk factors that i can’t modify : for example being male, white and 60 and a whole group of risk factors that i can do something about. There are also modifiable risks which i don’t have and i am very pleased to say that they are thought to be the highest ones in terms of risk ranking if you will. I’m not, for example, a diabetic and i have never smoked, neither have i suffered from significant mental illness. I do however have 3 risk factors which i have to do something about, these being hypertension, BMI and lipid profile : i see each of those as modifiable. In this post i want to say that i am putting nearly everything else on the back burner until i get this dealt with…or at least to the point where i have measurable results and feel that i am on the right track. Right now i am in week 2 of an initial 6 week plan, the 6 week marker being the period of grace i have been given as additional time off work because of the knee problem. It does also help that a 6 week plan is something that works very well in fitness training as it often takes that long to see results from an exercise routine. What i intend to do is this first 6 week plan with its specific ‘SMART’ goals and then re-boot. There is also a treat at the end of the 6 week mark but only if i have hit my goals. I have previously talked about SMART goals : ‘SMART’ in this sense referring to goals which are Specific, Achieveable ,Measureable , Realistic and Timely (there are other descriptive variants) and i am mainly working with that model here. The second side to this relates to JBP’s work on written self-authoring : in this case the future authoring suite which asks the question “where do you want to be in X years time” and/or what would your ideal life look like at that point. There are a whole load of useful sub-questions in that model such as “what would stop you getting there” and “how can you measure success or failure along the way”. 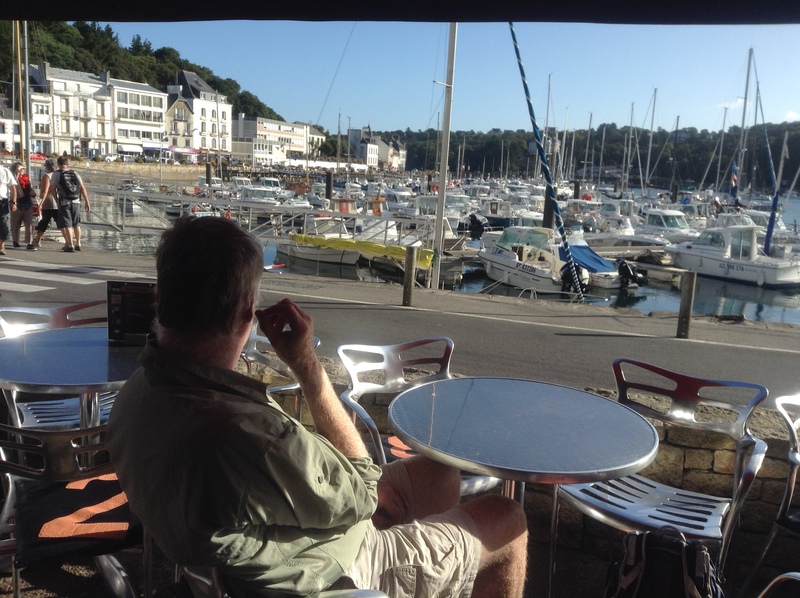 All of that works better for the long term question and answer….for me that in 5 years time i want to be, as i have jokingly said, at anchor somewhere nice and frollickking in the water nearby…..or at least sat in a harbourside cafe enjoying my morning cafe creme. However the question within the question : what would stop me getting there throws up several answers….for example not having a boat and not having good health and fitness to live the life. Here is a little sea-story that illustrates this. A parallel thread in the blog at the moment is me writing about live-aboard boaters and boating : i’m mainly writing that for a different audience. An example of liveboard boaters that i wanted to use was a man i know in his late 60’s living aboard a boat quite similar (slightly larger) than my last cruising boat and keeping his boat in a small local yacht harbour. I talked to him several times over a couple of years when i was in and out of that harbour and when i used their outer sea-wall to lean my boat against for her yearly scrub and paint. When we spoke then, he came round to see what i was doing, he told me that he was pretty well set up to go and this being autumn , that he was probably going to set off on his big cruising adventure in the spring of the following year. At that point i kind of lost track of him as i moved my boat away from that area for the winter and didn’t think about it until , through other sources, that the old boy had suffered a massive heart attack, only just survived but was now pretty sick with long term heart failure. The outcome of that being that his sailing days were probably over. I fnd that a sobering thought given my actual Q risk. So….i am in week 2 of my SMART plan to do specific things about reducing my modifiable risk factors ie getting my blood pressure under control and reducing my BMI….but this is where it gets not only a lot more interesting (to me) but a whole lot sharper and a lot more specific. Rather than just laying out a list of goals and explaining why they are SMART i thought it best to talk about what i am actually doing right now…aside from sitting on my BFA* at the computer of course. Remember also that my stated primary goal is to be fit enough in 4 weeks time to go back to work. The goals within that goal are to first mimic what a day at the hospital will be like physically, to have my BP under full control by medical means at this stage, to see a specific reduction in my BMI although not specifically using weight as a measure. Week 1, was the dietary induction and changeover week when i reduced my carbohydrate intake to as near low as possible. With that i went up on my intake of protein and fat. That might seem paradoxical given the need to alter my lipid profile but the evidence at the moment seems to suggest that high protein/moderate fat and a huge reduction of ‘fast’ carbs might be the way to go. It took a few days to kick in but by mid-week of week 1 i had established a daily dose of ketosis, in fact right now i seem to be in a ketotic state most of the time. I take that as evidence that i am metabolising my fat store which is the whole idea because my actual SMART goal isn’t ‘lose weight’ but ‘reduce body fat percentage’ and that weight loss will be secondary to that….in fact overall weight loss will also be secondary to an increase in muscle mass, notably in the weight and density of my left quads at the outset and then globally. In week 1 i also had the waterfall effect that comes with that kind of dietary induction and did in fact lose a whole load of ‘weight’ that is of course only water loss. The actual measurement that i will rely on more than crude weight loss is fat-fold measurement and crudely at first waist measurement because it’s the central abdominal obesity that has to go. The simple day by day measurement is actually my ‘belt notch’ position and my goal is 2 notches in (about 2 inches) in the 6 week period. Week 2 was the real start of ramping up the exercise again. I really am having to start back at a very low level of exercise…..i have no plans to do hill sprints and hit the weights room with 100kg deadlifts, rather it is a massive increase in my daily exercise to walk a slightly longer circuit around the local lanes. In fact at this stage i am essentially learning to walk again without crutches .So what i set as a goal was to find a starting point of paces done per day and then push that by adding at least 500 a day. Yesterday , as i write, my target was 9.000 and i actually did 10.000, today my target is 9.500 paces and so on. My second goal is the number of sets of specific single side leg exercises that i will do to start rebuilding strength and muscle mass in my left quad until it balances with the right side. At this point that’s just 2 sets but has a second goal of doing half of my everyday stair climbing with a left-right pattern rather than right-stop-left ie right side dominant stair climbing. My actual requirement , for work purposes, is to be able to stand and do a task for a reasonable time without support. I think the best way of getting to that will be to start on a simple project in the workshop. Week 3 plan will be to continue pushing the daily pace count out by 500 paces a day with a target point of 15.000 per day. The main week 3 plan is to introduce hard upper body work with either work at the gym on the bench press and pull-up bar and/or similar work at home with push-ups, pull-ups and dips. Once i work out a baseline for those they will become subject to daily and weekly targets. I think that what i will try to do first is to establish a hard exercise regime at home first and then if that doesn’t work then to go to the gym. Referring to the JBP-esque side of the plans then the one thing that might be a problem is getting on and off the floor into and out of a press-up position. If all goes well then in week 4 i want to get back aboard my boat and at least motor down the river for an overnighter and just see what my balance and stability is like aboard the boat. If that goes ok then i can start thinking about the autumn boat jobs and tee-up the next boat visits as an end of 6 week plan treat. Edit. End of week 2. Progress so far is that i have made my first goal of 10,000 paces at the end of the day, in fact i have done that 3 days consecutively. On one of those i tackled the local ‘tough’ hill known somewhat morbidly as ‘heart attack hill’ ! For most of my walking i am nearly but not quite off crutches and just about at the point of a left-right, left-right stair climbing pattern. In measurements : down one belt notch but that might be down to the water loss and reduction of abdominal bloating that goes with the reduction of carbs. This morning, as the post is scheduled, i will do a base weight now that the initial water loss is complete.